It was a day of firsts for Oliver's Real Food Racing's Jesse Featonby. 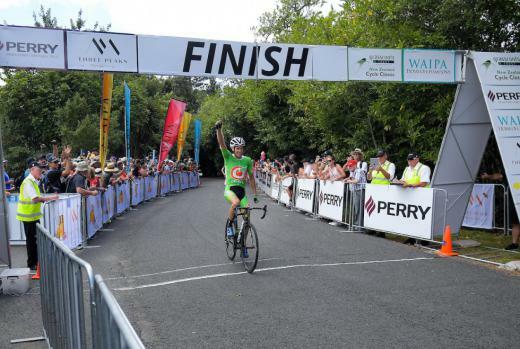 The former ITU triathlete turned road cyclist not only grabbed his first stage victory for his Australian based team but also his first UCI points after giving a blistering performance during stage four of the Grassroots Trust New Zealand Cycle Classic held on the outskirts of Cambridge in the Waipa region today. The 31-year-old from Aubrey in NSW, was part of a 15 strong chase group trying to close the gap on race leaders EVO Pro’s Aaron Gate in the yellow jersey and Team Nero Bianci's Jay Vine who lead by 48 seconds heading into the second lap up the steep and windy Maungakawa Hill. But with 1km to go, Featonby backed himself to take the win. Today’s gruelling 143.8km Queen Stage began in Cambridge and circled through Pukemoremore, past the Hobbiton Movie set before finishing on top of Maungakawa Hill. At 30km, a breakaway of five riders formed that was eventually caught by a chase group of three. Together the eight riders from teams New Zealand, Swiss National, Oliver’s, Futuro Cycling, GD Pringle, Rauland, AMR Renault and Mobile Communications wound through the hilly Waipa countryside extending their lead to 2min 30 over the peleton. At 81km the bunch was all back together and at 90km another group of eight riders broke away. Whilst there were lots of attacks coming from New Zealand and Team Bridgelane nothing really stuck. At approximately 100km, Gate and Vine made their move and extended their lead to 56sec on a 15-strong chasing group that included Bridgeland, Swiss National, Nero Bianchi, New Zealand and Oliver’s. This formation continued until the second lap up the hill when the chase group fractured and closed the gap on the race leaders. With crowds lining the narrow, steep hill road ringing cow bells and cheering the riders on, it was Featonby that took his chance. Foster Construction U23 Jersey and arguably got the loudest cheer of the day from the appreciate crowd at the presentation.